Raj Sharma has a hit placed on him by Pennsylvania's deadliest criminal organization. Raj Sharma started his career in Dallas, Texas and soon began performing all over the country. He was the co-founder of Indians at The Improv, a wildcard finalist for HBO's The Lucky 21 and is currently touring with Ahmed Ahmed's Next Generation of Evil Comedy Tour. His daily observations, childhood stories and lightning fast crowd work make him a must see for every audience. Tom Rhodes calls him "head-crushingly funny." Bryan Callen says, "He's funny in 3 languages: English, Punjabi and the Future." Raj Sharma began his comedy career in 2002 and has never looked back. A chance trip to The Improv changed his life forever. Born and raised in Texas, and brought up in a traditional Hindu household, gave him all the influence he needed. He is an original member of The Gurus of Comedy, Pundits with Punchlines, and The United Colors of Comedy. 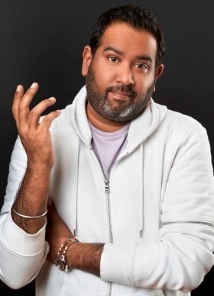 Eight years in and Raj has worked with some of the best comics in the business like: Tom Rhodes, Carl LaBove, Pablo Francisco, Frank Caliendo, Brian Regan, Bruce Bruce, and many more. His passion for comedy (and a lot of luck) has taken him across the country and across the globe, working in clubs and numerous colleges and corporate events. Raj's style of humor can be enjoyed by anyone of any age or background. Hilarious everyday observations, combined with his upbringing and sensational crowd work, is what you can expect at every show. Raj Sharma regales Kevin Nealon with stories of prison and child abuse. Raj Sharma talks with a mysterious man in a fur coat named Nacho. Dom Irrera, filling in for Kevin, asks up and comer Raj Sharma the tough questions. What do you do on an Orange day? If you hit Raj Sharma hard enough, he just might see a God!